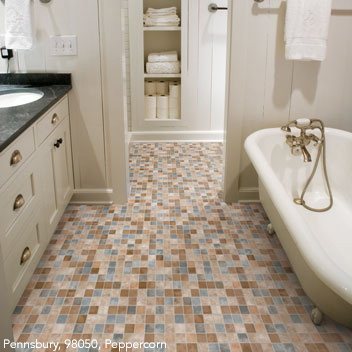 Pennsbury is a simple, yet transitional, 3” mosaic pattern. The combination of multicolored, transparent, and frosted glass tiles creates a modernistic, versatile floor that will compliment today’s popular home fashion looks. Click here for more information about Mannington Vinyl Flooring.